© (c) Trustees of the Paolozzi Foundation, Licensed by DACS 2015. In 1947, while he was still a student at the Slade School of Fine Art in London, Paolozzi had his first solo exhibition at the Mayor Gallery, London, and with the proceeds from sales he left for Paris in July of the same year. Over the next two years based in Paris he collected a vast amount of valuable source material for developing his ideas in collage. Much of the material was culled from American magazines given to him by ex-GIs who had stayed on in Paris after the war. The glossy colour imagery of a world of American consumerism seemed light years away from the drabness of post-war austerity in Britain, and the resulting collages made in the late 1940s and back in London in the 1950s, though rooted in Surrealism, are now recognised as forerunners to Pop Art, a movement Paolozzi’s name was to be closely associated with a decade later. 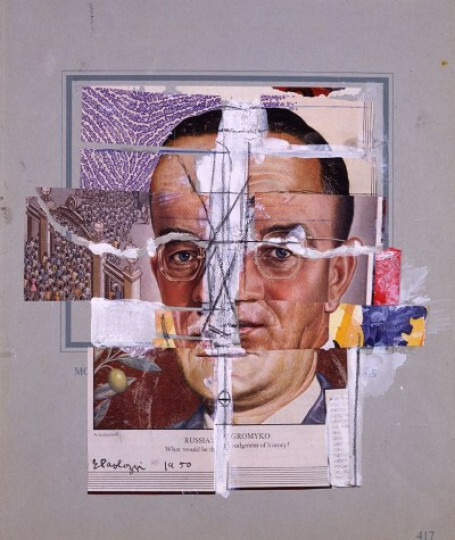 The images in this work are from Timemagazine covers and provided a starting point for the dissected head motif which remained a major preoccupation throughout the artist’s career. The two-dimensional form of assemblage made by affixing paper, card, photographs, fabric and other objects to a flat surface. It is often combined with painting and drawing techniques. This technique was first introduced by Pablo Picasso and Georges Braque in 1912 during their phase of synthetic cubism.